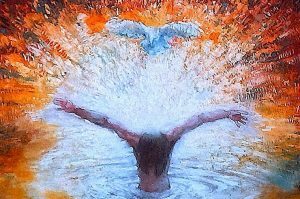 What spiritual reminds us that our baptismal vows must be rooted in our hearts? Christians barely finish singing the last verse of “We Three Kings” on Epiphany Sunday when, suddenly, it’s time to celebrate the baptism of Jesus. No longer a babe in the manger, now Jesus is thirty, being baptized by John in the Jordan River, and we know the courage he’s going to need in the next few years. On the day we retell the baptism story, we watch as some in our community are welcomed with the water, and then we step forward to renew our own baptismal vows. 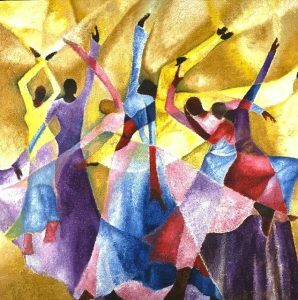 Often, as we renew our vows, we sing the plain, unadorned African-American spiritual, “LORD, I WANT TO BE A CHRISTIAN IN MY HEART.” We want to be like Jesus, to be more loving, to be more holy. We do not sing “Lord, I Want to Be a Christian in My Head.” Though using our intellect is crucial, we want an authentic faith rooted at the core of our beings, our hearts, and not get tripped up over theological arguments about how many angels can dance on the head of a pin or the concept of a Triune God. In his monumental work Black Song: The Forge and The Flame, Howard University scholar/ professor John Lovell, Jr. (1907-1974) discussed the double meanings found in songs that arose from communities of the enslaved, the “mask and symbol” at work in deceptively simple lyrics. tired, for example, of Christians who practice selfishness and brutality. It is tired of so-called Christians who go to church on Sunday morning and come home and beat their slaves on Sunday afternoon. So, using the mask of a song which seems to be praying for the Christian experience, it makes a commentary on the need for true religion, and the honest practice of the fine set of doctrines encompassed in Christianity. What does God want from us? Hint: the answer is never the ram or the ritual. The prophet Isaiah tells us to stop pointing fingers and speaking wickedness. According to Amos, God absolutely loathes our feasts and burnt offerings. Micah, too, says that God isn’t impressed by our offerings of thousands of rams, rivers of oil, or our first-born. So, what does God want? 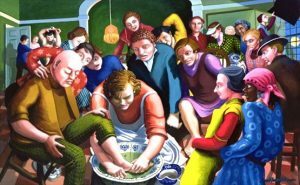 Isaiah instructs us to pour out ourselves for the hungry and the afflicted. Amos says that God wants justice to roll down like water and righteousness like an ever-flowing stream. According to Micah, the most straight-forward of the prophets, we are to work for justice, love kindness, and walk humbly with God. And then there’s Jesus. The enslaved listened to the stories about him: how he broke the rules, invited sisters like Mary and Martha to be part of the discussion, talked to women at the well, told judgmental law-and-order types to put their stones away, got the multitude to generously share their little bit of bread and fish with each other, knelt like a servant and washed the feet of his disciples, told stories in which the poor were invited to the banquet and the loathed outcast, a Samaritan, was a hero. Jesus knew the Ten Commandments. He had read the expanded and detailed dos and don’ts laid out in Leviticus and Deuteronomy. Still, he said it all boils down to two commandments: First, love God. Second, love one another. In Luke 4, 18-19, he said he had come to bring good news to the poor and to free the oppressed, and he commanded, in John 14:12, do what I do. Offering our rams and rituals would be so much easier! Just tell us which way to bow, how to kneel, where to buy the prayer beads. The enslaved, suffering on American soil, got it right with their simple litany: if we want to take his name and call ourselves Christian, we’ll need to be more loving, like Jesus. 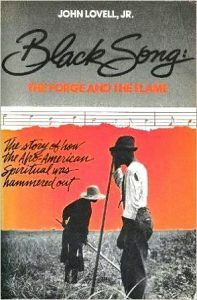 John Lovell, Jr., Black Song: The Forge and the Flame, The Story of How the Afro-American Spiritual Was Hammered Out (New York: Macmillan, 1972/ Paragon House, 1986).